Every year the T monster and I do a thanksgiving craft. I also always make fried apple pies every thanksgiving. This is a big hit in our family and always requested. What's awesome is they are so easy to make! This year I thought I'd share some of our traditions with you! 1. Let your toddler paint the white paper. There are no rules here. Just paint whatever wherever. Meanwhile, I painted the plate brown. Older kids can probably do this themselves. 2. Cut out a beak from the orange construction paper and a wattle from the red. 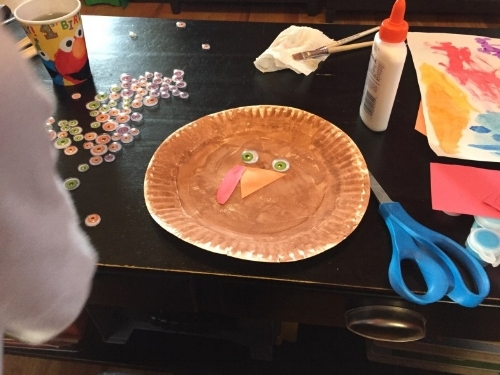 Your toddler can help you glue these onto the paper plate along with the eyes. 3. Once your child's painting finally dries (this can vary depending on paint usage), cut feathers out of the painted paper. Glue the feathers along the top of the plate. 4. Show off your finished turkey to everyone and anyone! Next, we have the apple pies. These are super simple to make and the recipe is easily multiplied for larger batches. 1. Peel and dice the apples. 2. Apple is a sauce pot and mix in cinnamon and brown sugar. Heat until warm. 3. Roll out the biscuits into discs. Place a heaping spoonful of the Apple mixture in the center. Coat the edge of the disc with water and fold over to seal. 4. Heat vegetable oil in pan. 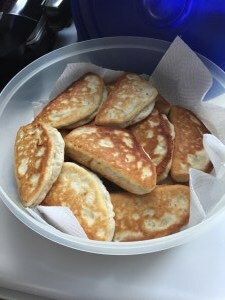 Once hot fry pies 2 at a time until they are golden brown. This should take a few minutes per side. 5. Set on paper towels to cool. Enjoy!! Both the food and the craft are super easy to make and they both were a hit!! The apple pies make a great on the go snack as well!! Hope you try these and let me know how they turn out! !